We have to face so many shipping terms and abbreviations during shipping or shipment (LCL sea shipment or air shipment) the products to the foreign buyers. In some cases, these terms are known and most of the cases its unknown to us. As an apparel merchandiser or responsible commercial personnel we should have clear idea about it. 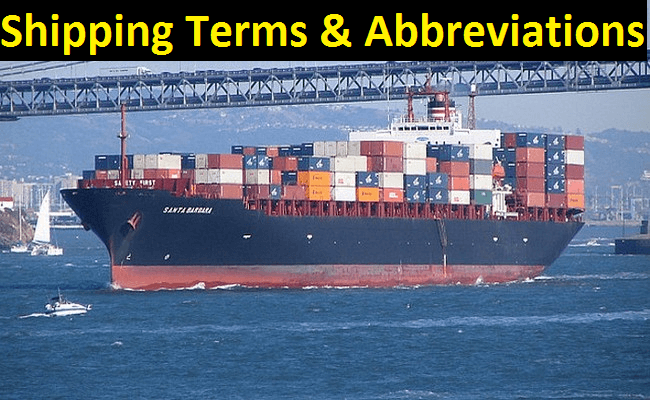 This article has presented mostly used 60 shipping terms and abbreviations which will be very effective in our merchandising or others career development. You may follow How to Calculate Shipping and Forwarding Cost of Apparel Export Order? CM stands at cost of making or cutting and making. FOB means Freight on board. C&F means cost and freight or clearing and forwarding. CIF includes cost, insurance and freight. In case of shipping terms, CIFI includes cost, insurance, freight and interest. CIFE means cost, insurance, freight and exchange. COD stands at cash on delivery. CWO means cash with order. FOW stands at free on wagon. CPT stands at carriage paid to. In case of shipping terms, CIP means carriage and instruction paid to. DAF means delivered at frontier. DES stands at delivered ex ship. DEQ includes delivered ex quay. DDU means delivered duty unpaid. DDO stands at delivered duty paid. A.D.I.S stands at automated computer based data interchange system. A/F stands at advanced freight. A.F.R.A stands at average freight rate assessment. A.G.B stands at any good brand. In case of shipping terms, Agt means agent or against. A.I.F.T.A means associate institute freight trades association. AP stands at additional premium or average payable. A/R stands at all risks (also A.R.) regards to insurance. ASABOSA means association of ships agents and brokers of South Africa. A.T.A means actual time of arrival. In case of shipping terms, AV means available container. BAF means bunker adjustment factor. BCV means barge carrying vessel. In case of shipping terms, BD means bank draft. B/E means bill of entry customs. BIFA stands at British international freight association of freight forwarders. B/L means Bill of Loading. In case of shipping terms, BN stands at booking note. B/P stands at bills payable. B.P.B means bank post bill. BSC means British shippers council. In case of shipping terms, BV stands at Bureau Veritas – French ship classification society. C&E stands at customs and excise. C.A.D stands at cash against documents. CAF stands at container availability forecast. C.A.N means customs assigned number. CCM stands at central container management. C.H stands at custom house. F&D means freight and demurrage. FCL means full container load. FCS means freight calculation sheet. FPD means freight payable at destination. 52. What is I.C. &C? I.C. &C stands at invoice cost and charges. I.C.B stands at International container bureau. IEF means International exchange file. I.S.F stands at International shipping federation. L/C means Letter of credit. SOB stands at shipped on board. In shipping terms, RPT stands at rate per ton. This is very useful for apparel merchandiser.